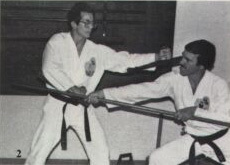 The tuifa, or tonfa, as it is commonly called in the United States, is the easiest of all weapons to learn, according to Isshin-ryu black belt A.J. Advincula of Oceanside, California. It is very difficult to lose or drop because of the convenient handle. And it can be used with most basic blocks. 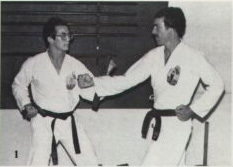 Once learned, the tuifa can be applied to any karate kata (forms). The most popular tuifa kata on Okinawa is hamahiga no tuifa; it is named after Hamahiga, a very small island off the main island of Okinawa. Advincula learned this kata from Tatsuo Shimabuku, who was taught by the famous Okinawan Kobudo master -- Taira Shinken. The tuifa was originally used on the island of Okinawa as a handle for a millstone. In its initial configuration the tuifa couldn't be implemented as a rotating weapon, although there is the possibility that it may have been wielded like a hammer. The older tuifa were not machine-made as they are today. They were constructed from various types of wood, ranging from soft pine to very hard oak. Also, the earlier tuifa didn't have a grip head. Advincula believes there is evidence to support the theory that the tuifa evolved not only from the millstone handle, but also from the flail. However, the fighting tuifa most likely originated from the larger millstones, as the handles of these combative tools were much larger. The best tuifa are made on Okinawa and are usually custom-designed for each individual stylist. It is important to select tuifa held together by wooden wedges which secure the handle to the shaft. Do not select tuifa with a round handle adhered to or glued onto the main shaft -- they are not sturdy and will break easily. Many inferior tuifa not made in Okinawa have handles that are pinned or stapled to the side of the shaft. This faulty protection can cause the tuifa to shatter if struck by a heavier weapon. The tuifa shaft should extend slightly below the elbow to protect the elbow an forearm, if it is too long, however, it becomes unwieldy and difficult to use. The tuifa can be wielded both offensively and defensively. Advincula demonstrates a middle block (1)"Inside: against a punch, a defense (2) against a bo, blocking (3) and kicking techniques and an isshin-ryu punch (4). The shape of the tuifa is a matter of personal preference, however, Advincula says the lighter, round tuifa- while easier and faster to use -- can an be painful if wielded in combat situations against heavier weapons such as the bo. A round tuifa will not absorb the force of a blow, but will instead assist in directing the impact into the forearm. The half-moon and flat-shaped tuifa are heavier and stronger and fit the contour of the forearm to effectively absorb the shock of a heavy strike. Besides being an effective offensive weapon, the tuifa is also handy for blocking. Isshin-ryu's Shimabuku taught eight basic blocks utilizing the tuifa. They include the upper block, middle block, lower block, cross-inside block, X-block, middle block extended (using the bottom of the tuifa), down block extended (also using the bottom of the tuifa), and the double middle block. Although there are other blocks, they are simply modifications of those already mentioned. For the most part, tuifa stances are the same as those used in karate. Advincula says to avid the following techniques -- not only because they are ineffective, but because the practioner could be subject to injury. • The X-block or upper block with the grip head of the tuifa directly over the head. 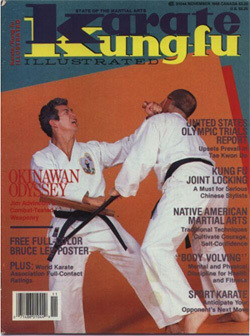 For example, a heavy blow from a bo against the tuifa will drive the grip into the defender's head (this is a very common mistake made by U.S. tuifa practioners. • A middle block extended with the side of the tuifa against a heavier bo may send the tuifa back into your body. Use the bottom -- not the side -- of the tuifa to avid this problem. • Blocking with the arm fully extended. In reality, the arm should be bent slightly to absorb shock and to force the opponent's weapon to ricochet off the tuifa and away from the body. 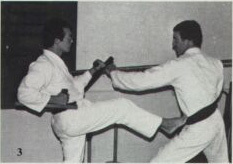 A locked elbow will cause the opponent's weapon to travel along the shaft of the tuifa into your body. Okinawan master Tatsuo Shimabuku taught eight basic blocks using the tuifa. Here, Advincula displays the upper block (1), middle block (2), lower block (3), inside block (4), and X-block (5). Karate stylists in systems utilizing the twist punch find it difficult to punch with the tuifa because the grip head has a tendency to snag on the outer clothing. This usually occurs when executing a reverse punch. Other stylists will use the twist punch when striking with the front head, but not with the back head. Isshin-ryu is ideal for the tuifa because the twist punch is never practiced. 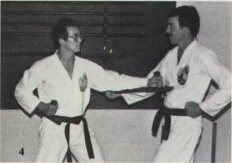 Rather than relying on a twisting motion for power, an isshin-ryu stylist can spin the tuifa fro the forearm position to the extended strike for a tremendous advantage in reach and power. According to Advincula, practioners should change grips while training with the tuifa, however, this is not recommended in a combat situation since there is a risk of dropping the weapon. Advincula also recommends manipulating the tuifa by grasping the back head and using it to strike like a hammer, or to catch an opponent's arms or legs. Before using the tuifa, make sure the grip is firmly attached to the main shaft. Quite often, the grips of inferior weapons become loose with use, resulting in potential hazard to the student or other students in the dojo. Tuifa made outside Okinawa are usually lacquered or painted. To prevent the wood from drying and cracking, remove the lacquer and be sure to oil the weapon. For a superior finish, Advincula recommends either lemon oil, tung oil, or a mixture of two-parts boiled linseed oil to one part turpentine. These oils will make the weapon heavier, keep it from drying out, also make it easier to spin. Sanding the grips and applying talcum powder to the hands will facilitate easy manipulation of the weapon. Advincula shows how to hold the tuifa in a proper stance. Many police departments have adopted a baton similar to the tuifa called the PR-24. Advincula states that while the PR-24 is generally easier to retain than a nightstick in combat, it is not an adequate weapon for the following reasons. • The PR-24 is available in only two sizes -- large and small --instead of being custom-fitted to the individual. • The PR-24 has a roundish shape. If it is used on the forearm to ward off blows (as discussed with the tuifa) it will lead to the blow being absorbed by the forearm, rather than by the weapon. • The handle of the PR-24 is not fitted to the individual and is poorly designed. This flaw allows the hand to slide up the handle, leaving a gap between the forearm and the shaft of the baton. Should the shaft be hit by an opponent's weapon, the shaft will be driven into the forearm and cause an injury. The grip should be both stable and adjustable, allowing the individual's hand to fit snugly between the shaft and the grip head. Advincula states that most police agencies are also teaching inferior techniques with this weapon, such as the high-post position (by the shoulder with the shaft resting over the top of the forearm). This position can only be used for swinging the PR-24, If it was posted with the shaft against the forearm, the weapon could be used for either a block or a strike. A proper technique should always have multiple applications. About the Author: Robert B. Safreed, director of security for the space and defense sector of TRW, Inc., is an isshin-ryu stylist based in Los Angeles.